The Adidas Pro Model is available at a very affordable price point. Buyers can choose from the multiple colorways offered in the market. A handful of buyers commended the high-quality materials used in the Adidas Pro Model. The majority of buyers applauded the classic design of this pair. Some even shared that the Adidas Pro Model brings back the fond memories of their childhood. The fresh and clean profile was praised by many users. Few of them shared that they get compliments from wearing this shoe. Some users attested to the durability of this pair. The lightness of the Pro Model was enjoyed by many users. Few users adored the just enough ankle cushioning thus giving nice ankle support. Various wearers revealed that they would definitely recommend this pair to their friends. The Pro Model is easy to maintain, said some users. They can easily brush or wipe the dirt away. A handful of buyers complained that the Adidas Pro Model has inadequate ventilation. A couple of users griped about the poor ground grip of the Pro Model. Few purchasers revealed that the leather upper creases easily. One critic shared that this pair needs long break in period. Adidas reconstructed a 70s basketball shoe with all its classic details. The Adidas Pro Model is the mid-cut version of the renowned Adidas Superstar. Adidas recreated it by adding more padding to the ankle to give superb ankle support. One would not miss noting the iconic rubber shell toe, which is a trace of its iconic ancestry. This all-leather build features a street-wear style suitable for any casual getup. It is almost guaranteed that wearers will feel like a pro on or off the court while wearing the Adidas Pro Model. Adi Dassler first made his shoes using some materials available after World War 1 in the 1920s. He registered his shoe company in 1948 after a rift with his brother and named the company Adidas. Since the beginning, Adidas has been known for their excellent sports products available all around the globe. Adolf Dassler has been known as the Father of the Modern Running Shoe. Dassler and his entire company have been following a simple philosophy since the beginning. They have been strict in abiding by their core company value, and that is to provide every athlete with the best possible equipment. Fast forward to the present days; the company has continually innovated to widen their product line-up - from shoe down to the clothing and accessories for various sports. In the field of basketball, Adidas' oldest hardcourt shoe was introduced in 1949, which also functions as multi-purpose footwear for the US Army. The prototype b-ball kick was dressed with canvas upper and delivered ample protection. It was inserted with soft cushioning, stiff toecap and a heel counter and padding on the ankle. Twenty years later, the Adidas Superstar was introduced, which was derived from the Supergrip model. The brand added the rubber shell toe to enhance the protection on the vamp, which later on turned into the most iconic element of this model. The Superstar was the most successful model in the 70s and was seen worn by many NBA superstars in that era. Aside from the iconic Superstar, Adidas released countless basketball shoe models during the 70s, and one of them is the Pro Model. Although considered as one of the classics and lies in the 13th place in the list of all-time Best Adidas Sneakers, the Pro Model has been underrated and always been overlooked by collectors. The Adidas Originals Pro Model is a leather mid cut profile that displays all the classic details of the Superstar with ample ankle support suitable for the high jumps on the hard courts. The brand offers this in a wide range of upper materials and in various colorways to suit the vast preference of its followers. Currently, the Adidas Originals line incessantly finds ways to reintroduce the Pro Model to the present-day market by recreating it with a modern spin. This iteration has been used as a canvas for many partnerships and revamping over the years. Some of the famous collaborations with the Pro Model are with Pistol Pete in 2005 which showcased green and blue Adidas stripes and words Pistol Pete on the tongue. Another partnership is the all black Big Sean collaboration in 2013, and also the Mastermind Japan with Velcro and the Tuff Gong reggae inspired collaboration in 2008. Meanwhile, in 2016, NIGO partnered with Adidas to come up with the Bearfoot motif of the Pro Model. 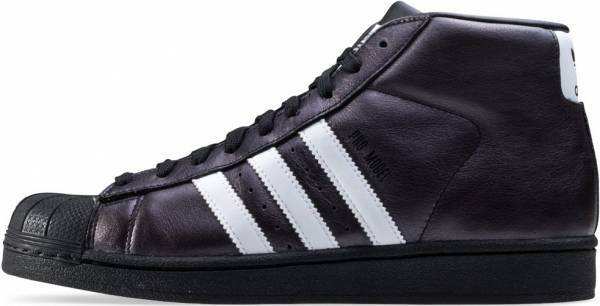 The mid-top Adidas Pro Model is considered the replica of the famous basketball shoe in the 70s, the Superstar, but with a higher collar height. This sporty profile was able to shift from the athletic feel into a streetwear vibe. The versatility and the comfort of this pair allow it to be used in the streets for all-day strolling. The Adidas Pro Model is made of suede or full grain leather upper to give its wearers comfortable and soft feel strides while providing a plush appeal. Few of the notable colorways presented in the market are the Cloud White, Scarlet, Collegiate Blue, Clear Brown, and Core Black. In 2015, Adidas introduced the winter-ready version of the Pro Model by retooling it with Gore-Tex material on the lining for its waterproof finish. This winterized version features the classic shell-toe with canvas-like upper with few rugged metal hardware on its lacing system. For better traction on slippery surfaces, this model was upgraded with a ripple effect on the outsole. After the Superstar and the ZX Flux, the reflective XENO detail was used in the Pro Model shoe to give it a vibrant, iridescent upper that offers an array of rainbow colors once the light shines on this sneaker. This reptilian-inspired technology is offered in two colorways that give this classic silhouette a technologically advanced look. With the countless variations of the Pro Model in the market, many users find it easy to style this mid-cut kick. Many fashionistas prefer wearing their Adidas Pro Model casual shoes with their oversized baggy or skinny jeans that are finished off with tees. Sometimes, some add up oversized pullover to enhance the relaxed look during the cold weather. This sneaker is an excellent complement to any item in anyone’s wardrobe. The Adidas Pro Model shoes have well-padded ankle and tongue to maximize the superb comfort and fit. It has a well-cushioned PU insole that absorbs shock which is useful especially during impact. Meanwhile, the molded EVA midsole allows the wearer to enjoy comfort with its lightweight cushioning. In addition, the lace-up fastening system gives its wearer a personalized snug fit for cozy strides. The men's Adidas Pro Model generally runs true to size and available in sizes from 4 to 14 US in medium width. The Adidas Pro Model sneakers carry the iconic feature of the Adidas Superstar, which is the rubber shell toe. This feature is originally placed in order to provide sufficient protection on the toe thereby enhancing the stability of the users while playing basketball. This feature has become the iconic element of the SS model and seamlessly turned into one of the major influences in the sneaker culture. The Adidas Pro Model men’s shoes have a soft mesh that works as the inner lining. This enhances the kicks comfort and overall breathability. The Pro Model has a non-marking rubber outsole that delivers reliable traction on different surfaces. The herringbone pattern can be seen in its rubber cupsole. The Adidas branding can be found on the heel patch and the tongue. The “Pro Model” gold text is found parallel to the 3-Stripe on the side. This model approximately weighs 493 grams.